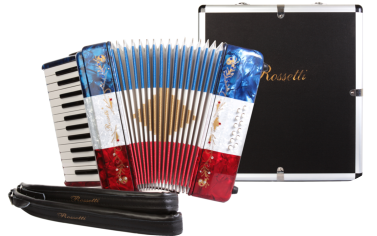 Rossetti 12 Bass/25 Key Piano Accordion This beautiful piano accordion with its Italian style decorations and bright pearlescent finish comes in several colors. There are 15 white keys and 10 black keys. The first key starts on G. There are single straps hooks on each side of the accordion with plenty of room for the two extra- long leather padded shoulder straps. The accordion also includes an adjustable left hand strap. A custom grill design offers a beautiful touch. A slide lever air valve makes for faster air intake. The accordion comes in a premium case with lock and logo. The case is big enough to leave the straps on. Colors include: Red, Blue, purple, green Black (solid), White, GOLD, Grey (with silver buttons), Red/White/Green (Mexican Flag), Red/White/Blue (USA flag). Adjustable hand strap Easy access front panel Keyboard width: 11 3/4" Key width: 3/4" Overall dimensions: 14 1/4" x 13 1/4" x 7 1/2" Case dimensions: 16" x 15" x 9" Weight: 8 1/2 pounds (without case) 15 white keys and 10 black keys. The first key starts on G. Adjustable hand strap: includes an adjustable left hand strap Padded shoulder straps. Easy access front panel A slide lever air valve makes for faster air intake. Keyboard width: 11 3/4" Key width: 3/4" Overall dimensions: 14 1/4" x 13 1/4" x 7 1/2" Case Included dimensions: 16" x 15" x 9" The case is big enough to leave the straps on. Weight: 8 1/2 pounds (without case) This Rossetti Button accordion features Italian Style decorations and pearlescent colors.